There has been a lot of fog in the county this week. Fog is the suspension of liquid water droplets in the air near the earth’s surface that reduces visibility to less than one kilometer. Also important is the dew point temperature. Dew point is the temperature of the air if it is cooled to saturation. If the outside air temperature and the dew point temperature are within three degrees, fog will develop. Of course, cooling of air is the most common mechanism by which fog is produced. Cooling of air may occur as a result of diabatic processes in which heat is removed from the air or adiabatic processes in which no heat is removed. Diabatic processes include radiation and conduction. Adiabatic cooling occurs when air expands as it is lifted and pressure decreases. Fog produced by diabatic cooling is most common near the ground. Conductive diabatic cooling occurs when moist air comes in contact with a colder surface such as snow, cold water or cooler ground. The marine fogs of the west coast are caused by the cooling of low level air by cold water. 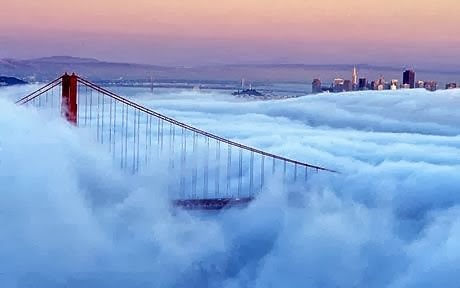 San Francisco is perhaps the most famous for its fogs. These great summer fog banks pour inward under the Golden Gate Bridge riding the sea breeze. These fogs do not survive more than a few kilometers inland during the day because the surface heating erodes them from below. These fogs are beneficial near the coast because they contribute moisture to vegetation during dry seasons. For example, the needles of redwood trees strain the tiny water droplets from the air. The droplets drip off the trees providing necessary water. These redwoods grow only on the coast. Thirty miles inland, where fogs rarely reach, redwoods cannot survive. However, not all fog is beneficial. The Italian ship Andrea Doria was a luxury liner. On 25 July 1956, while approaching the coast of Massachusetts, the eastbound freighter Stockholm collided with the Andrea Doria. Struck in the side, the top-heavy Andrea Doria immediately started to list to starboard, which left half of its lifeboats unusable. The shortage of lifeboats might have resulted in significant loss of life, but the efficiency of the ship's technical design allowed it to stay afloat for over 11 hours after the ramming. (The pictures are remarkable.) The professionalism of the crew, improvements in communications and the rapid response of other ships averted a disaster similar to the 1912 Titanic. 1,660 passengers and crew were rescued and survived. Sadly, 46 people died. The evacuated luxury liner capsized and sank the following morning. This accident remains the worst maritime disaster in United States waters. Fog was a contributing factor. However, the worst fog in the world is the fog produced by those seeking elected office. So this week, I warn you about the upcoming elections and the candidate-generated political fog. This political fog obscures good vision, judgment and decision-making. Keep your vision keen and unencumbered!